Christian Page, author of The Iron Gollem, kicks off his book tour in Seattle on April 16, 2015. 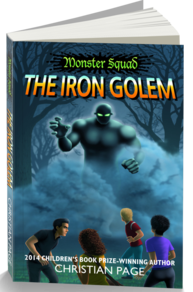 Bountiful, UT, April 15, 2015	(Newswire.com) - “Monster Squad: The Iron Golem” is the debut book from new author Christian Page, which has received rave reviews from journalists and readers alike. Available as an eBook and paperback (296 pages), the book was published by New Generation Publishing in November, 2014. Aimed at the young adult / mid-grade audience, it was named winner of New Generation Publishing's 2014 Children's Book of the Year Award. 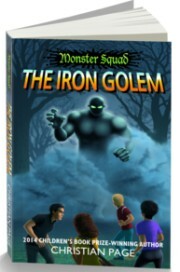 “Monster Squad: The Iron Golem” is the first in a planned four-book Monster Squad series, with the second book, “Monster Squad: Jekyll & Hyde” planned for release in Spring 2015. Page is currently writing a third standalone book called “The Unseen”. Christian Page will kick off his book reading and signing tour in Seattle on April 16th. He will be visiting the following locations in-store at the dates and times listed below. He will also be available for interviews and appearances. Dark forces are converging on the sleepy town of Autumn’s Hallow. Monsters in the woods, mad scientists on the loose and sinister minions lurking in the shadows. Four young friends must band together to uncover a secret plot that threatens them, the town they live in and the people they love. Meet Blaine, Dash, Shelley and Drake, aka the Monster Squad. These four friends have just found out they are the heirs to fantastic powers, and an evil mad scientist wants them for lab rats... and, oh yeah, they each have ten pages of Algebra homework due on Monday. Using smarts, courage and friendship they will battle the nefarious Victor von Frankenstein and his mutant freak show in an exciting new award-winning series! “…The action is non-stop, and the writing is very tight, suspenseful, even gripping in some parts, and inventive, definitely creative. I wouldn't be at all surprised to see it made into a movie…"
Christian Page loves stories that combine fun, action and adventure. A father of two, he lives in the Pacific Northwest of the United States with his wife, son, daughter, overly plump cat and under-behaved dog. You can visit the author to learn more about his stories and upcoming work at www.chrispage.com or follow him on Facebook (Chris Page) or Twitter (@chrispagewriter).